Reclining chair, wood frame and fabric upholstery. This item is in original condition, can be sold as it is or fully restored. The price shown is in original condition. Mid-Century Modern Danish rosewood chest of drawers. This item is in original condition, can be sold as it is or fully restored. Handsome Danish Modern midcentury armchair by Illum Wikkelso for Niels Eilersen. Made of solid teak wood and upholstered in the original black faux leather. Measures: Arm height 26. Very interesting Mid-Century Modern armchair, wood frame with vinyl rope on seat and back. Great piece! 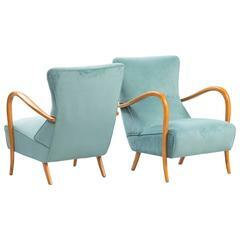 Set of eight beautiful rare palisander armchairs, designed Danish furniture designer by Ole Wanscher for Poul Jeppesen. The chairs have blue upholstery. From 1950s. Elegant, Mid-Century Modern, armchair features a sculptural ebonized maple frame with aubergine cotton linen blend upholstery.